In an era of colossal cruise-liners and nuclear-powered submarines, the notion of sending sailors aloft to secure canvas sails might seem best left to a Johnny Depp movie. But for maritime students who sign on for a hitch aboard the Tall Ship SSV Oliver Hazard Perry, climbing rope ladders is an intriguing step to an exciting career at sea. The first ocean-going full-rigged ship to be built in the U.S. in over 100 years, the Oliver Hazard Perry is America’s largest civilian sailing school vessel. Named for the nineteenth-century American naval hero whose battle flag read, “Don’t Give Up the Ship”, the Rhode Island-based Perry was launched in 2013. By the numbers, she is 200 feet in length with a beam of 38 feet. Three towering masts hold seven miles of rigging, twenty sails, and 14,000 square feet of canvas. 160 belaying pins help to hold the rigging in place. In total, the Perry is 13 ½ stories tall. U.S. Coast Guard safety standards for sailing school vessels differ from those of passenger vessels on a comparable route, because persons aboard training ships are not passengers, but rather participants who fully share in the ship’s operation. With a seventeen-member professional crew and accommodations for 32 people overnight, the Perry is the perfect size for intimate instruction in the rigors of life at sea. But learning the difference between knots and nauts is only part of the curriculum. Underscoring the indispensable importance of being a good shipmate is the goal for all hands on board. 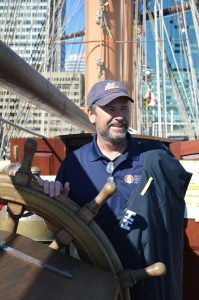 Last month, while on a two-week journey to Florida, the Perry made a brief stop in Baltimore as part of Sail Baltimore. Greeting this reporter for a tour of the ship was Captain Anthony Arrow. Arrow said he has been working at sea in one way or another for 35 years. For most of that time, he has been in the education field. “I’d never been on a boat ‘til I was about 20 years old, when my dad signed us up on the Mystic Clipper, which sailed out of Annapolis. We went on for a week and got yelled at and did dishes and sailed the boat. I really liked it, so I bugged the captain for a job, and he hired me the next season as a steward. “I spent a few years on passenger boats, but I saw that the education boats were doing cooler trips; going to the Carribean and Europe. I also saw what an incredible way it was to teach people. It’s all hands-on instruction, and that works for me. I was not a successful classroom-type student, so seeing it work for young people is the reason I became so passionate about it. What kinds of jobs are available to Perry veterans? Arrow told me the shipboard instruction is open not only to young people but also to adults. Looking at life decidedly differently, after years behind a desk, is Virginia native, Sid L. Dunn. “I was in the insurance business for the last 16 years,” explained Dunn. “I reached an age where I wanted to retire and become a merchant marine. 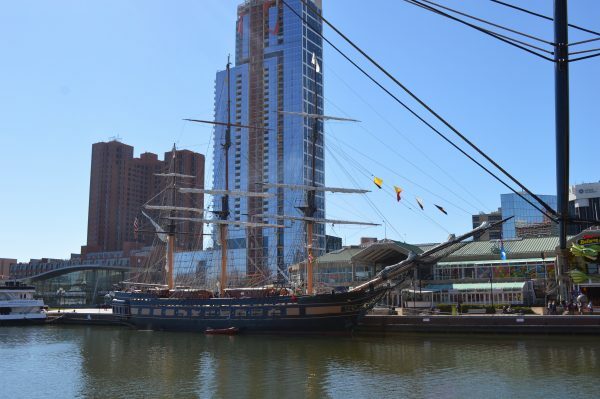 I went to the Mid-Atlantic Maritime Academy, so sailing on this vessel along with my classmates is our internship. I’m really enjoying it. Dunn said he was originally scheduled to sail as far as Jacksonville, FL, but he was asked to stay aboard until the Perry reached Galveston. 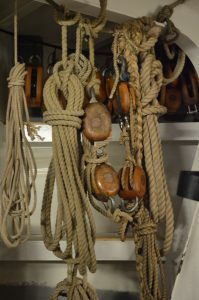 Dunn acknowledged the fact that jobs on square-rigged ships are few and far between, but he said ultimately, it is all about the ship-board experience. “Learning how to be a good shipmate while living in close quarters with the others onboard; that’s paramount. But it’s also about learning basic seamanship skills. They’ve been doing this for hundreds of years, and the basics have never changed. Before wrapping up my tour, Arrow introduced me to several other members of the crew. Two were Katie Riley – a marine biology instructor who holds an officer-level grade aboard the Perry, and Donna Vestuti – a top-flight chef from New York, who signed on for a taste of adventure. Could a scientist, a chef and an insurance professional have more to offer a seasoned journalist? 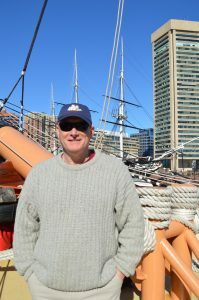 Starting Wednesday, this writer will be sailing from New Orleans to Annapolis on the SSV Oliver Hazard Perry. Don’t look for updates to this piece, arm-length selfies, or a meandering blog – I’ll be leaving my laptop at home. When I return, however, I hope to share my shipboard experiences in a series of special reports. Till then, this much I can promise: I won’t give up the ship.